“I never realized how much at risk we are. 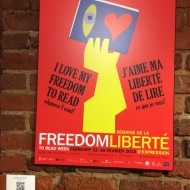 And how important free expression is in a democracy. But being told to shut up about such an important issue, really brought it home. 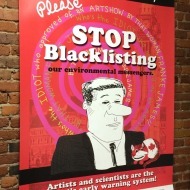 And so, I’m not going to thank Stephen Harper for blacklisting me, however, I have learned an awful lot…. 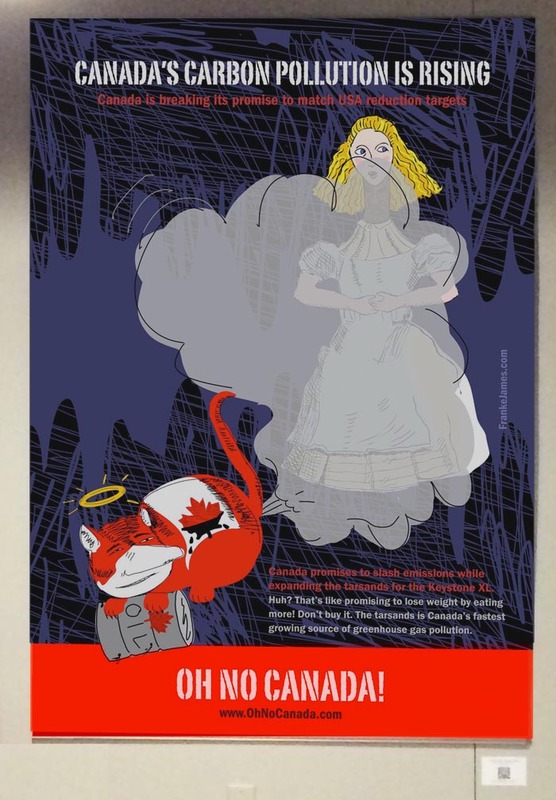 Ironically, many of the 35 artworks in my solo show would never have been created if the Harper Government had not tried to shut me up. 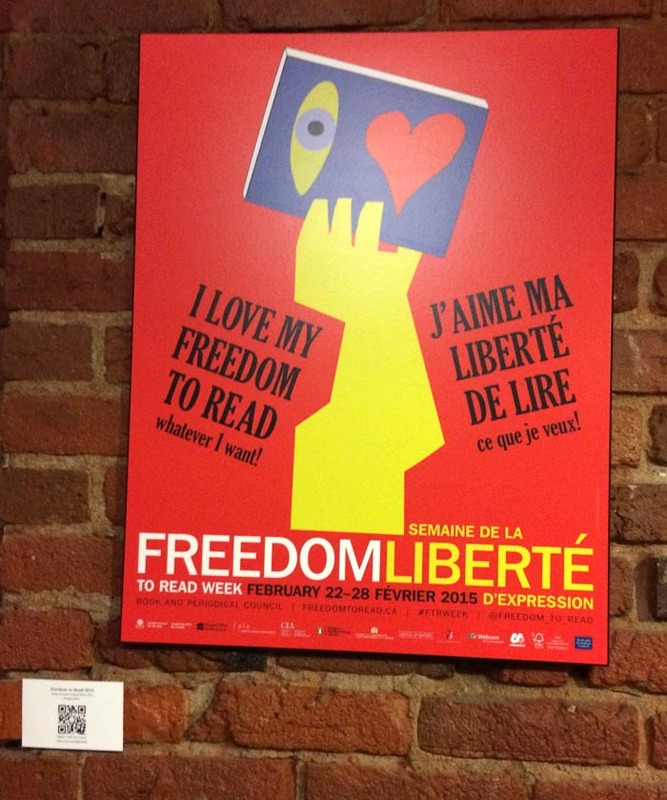 1) The prints that were supposed to travel across Europe in 2011 — but got nixed by the Harper Government were on display. 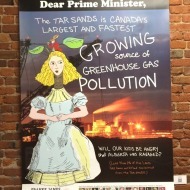 2) The Dear Prime Minister posters that fought the Harper Government censorship by asking Harper to stop blacklisting environmental voices were there. 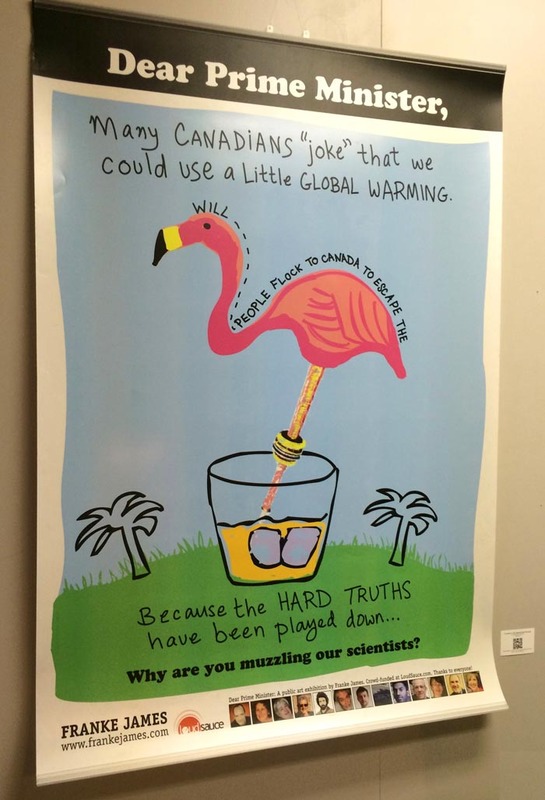 3) My “Do Not Talk about Climate Change” poster and “Oh No Canada!” posters that had been shown in bus shelters in Washington, DC in 2013 were there too. 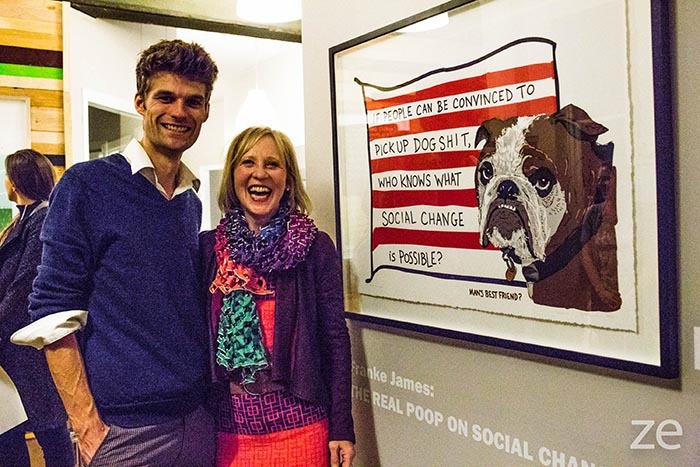 In all “The Real Poop on Social Change” represented six years of work. Zack Embree hopped over from Vancouver and took some fabulous pics. 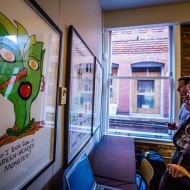 Check out my post about the show below, which also has videos shot by Zack. See more on Facebook. 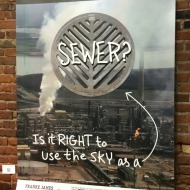 That’s what CBC Host, Gregor Craigie, asked me during my radio interview about the Real Poop show. I laughed at Gregor’s question — because persuading industry (and citizens) to reduce carbon emissions is a challenge. Many people don’t even want to think about climate change. And can’t make the mental leap that citizens picking up dog poop could provide the answer to such a big global problem. 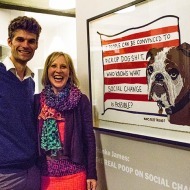 In fact the success of the New York Poop Scooper Law gives us the template we can use to reduce carbon pollution. Back in 1978 there were many naysayers who said that citizens would never, never, ever pick up after their beloved dogs — but miraculously, people did!! And it’s been such a success that many municipalities in North America have copied the NYC legislation. Dog-owners now are expected to stoop and scoop — or face a fine and the glare of angry onlookers. There is a great lesson for us in that. 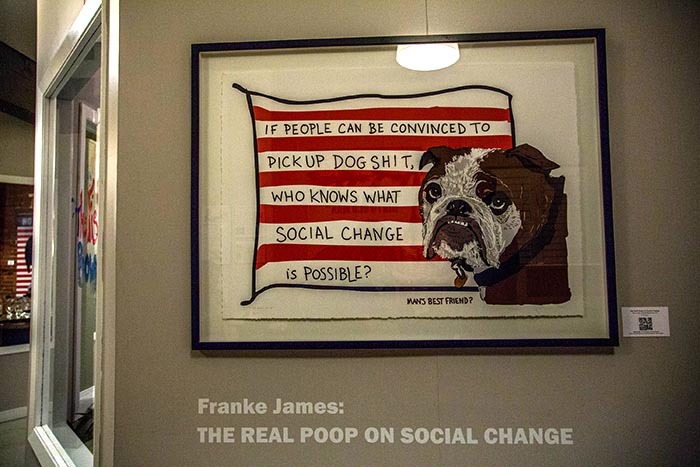 If people can be convinced to pick up dog poop — what else will they be willing to do — with the right incentive — for the good of society and the planet? We just haven’t aimed high enough. Changing light bulbs? Pffft! We need a hefty price on carbon pollution. That will encourage people to switch in a hurry. Smoking. Drunk Driving. Recycling Trash. Next Goal: Carbon Pollution! 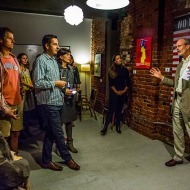 With the right combination of policy and social awareness, society can make big changes. Doubtful? Well, just take a minute to remember some of the big ways that society has already changed for the better. Smoking has been outlawed in most public places. Drunk driving is now seen as a major taboo. Recycling and composting is commonplace. And most people do pick up after their dogs. These are all examples of how policy and social awareness (and social pressure) can work together to change our behaviour. 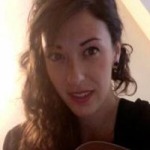 Music is another great example. Just 30 years ago, we listened to music on vinyl albums. Now we carry music around with us. And, that is not just a technological change, it’s a behavioural change. We need to make a similar behaviour change to whack down our carbon emissions. The fossil fuel divestment campaign is making strides. Modelled on the anti-apartheid movement, fossil fuels are becoming a pariah investment. The Heirs to the Rockefeller oil fortune recently divested from fossil fuels over climate change. 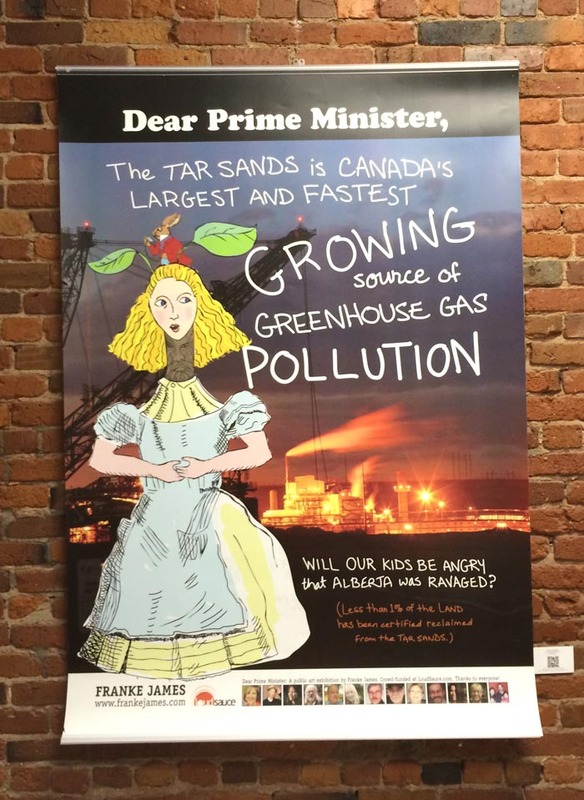 Their $50 billion dollar decision sent shockwaves around the world, and in Canada’s oil patch. 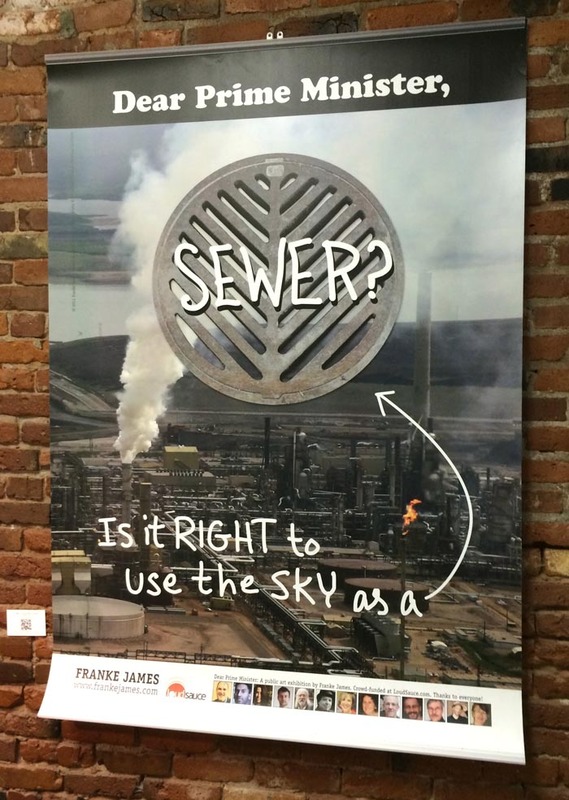 But how can we reduce carbon pollution when the Harper government wants to use the sky as a free sewer? And they don’t even want us talking about climate change! 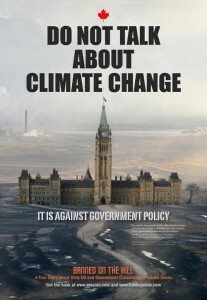 “Canada could be leading the fight against climate change, but instead we have become an international embarrassment. 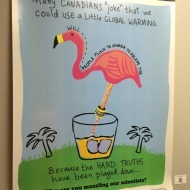 Beyond just muzzling our scientists, last week it was revealed that the government is muzzling weather forecasters at Environment Canada by not allowing them to even discuss climate change in public. Conservatives have systematically undermined scientific freedoms, defunded basic research capacity, dismantled the National Research Council and gutted environmental assessment. 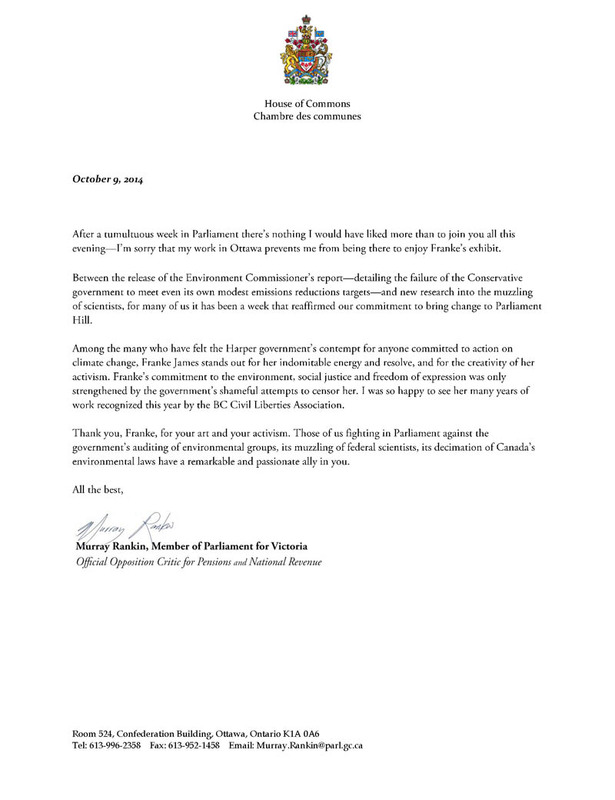 Murray sent me a remarkable letter that really nailed the problem we’re facing — and also let me know that my art has been noticed in Ottawa — and is greatly appreciated (by some)! 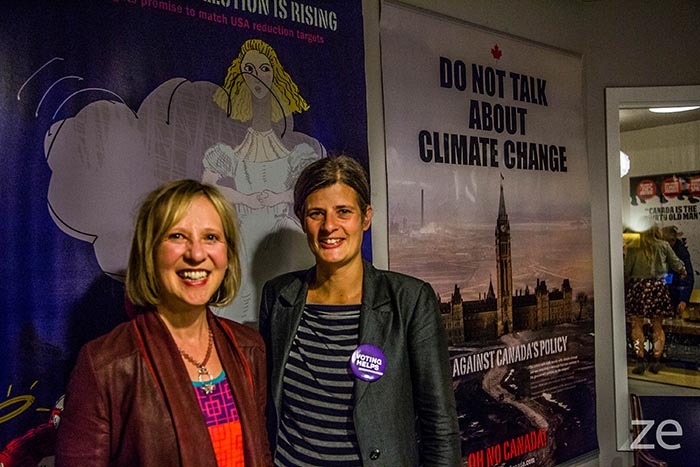 “Among the many who have felt the Harper government’s contempt for anyone committed to action on climate change, Franke James stands out for her indomitable energy and resolve, and for the creativity of her activism. 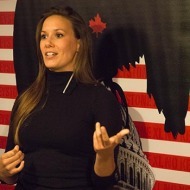 Franke’s commitment to the environment, social justice and freedom of expression was only strengthened by the government’s shameful attempts to censor her. 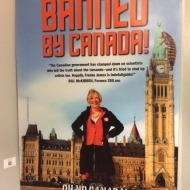 I was so happy to see her many years of work recognized this year by the BC Civil Liberties Association. 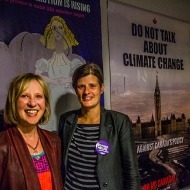 The times they are a’changing: My Member of Parliament’s recognition of the urgent need for change in Ottawa is the perfect segue to Dr. Thomas Pedersen, from the Pacific Institute for Climate Solutions and Carol Linnitt from DeSmog Canada who joined me in speaking about politics, art, and how to make real change happen. Tom is exactly right. 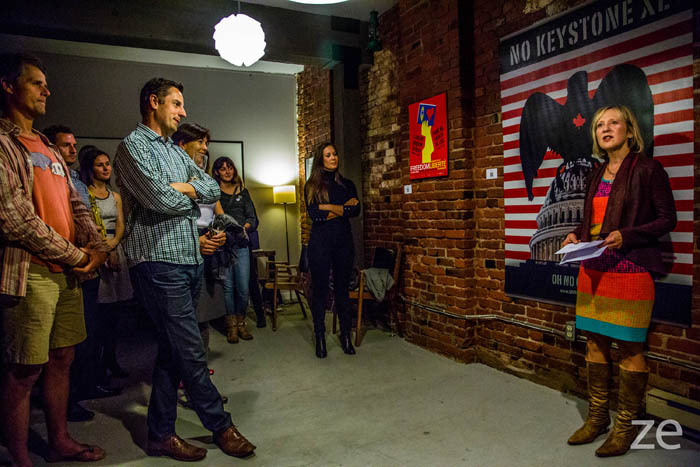 We do need thousands of bedbugs agitating for change — and if they can use art to communicate their ideas on change — all the better. “When I first realized that I’d been blacklisted, I called up a whole bunch of smart people… One person said “Run towards the controversy.” And I went “What? Run towards the controversy?” Like, how stupid do you think I am, I mean really? Run towards the controversy? But actually, he was right, because it’s only by running bravely right into the fire that you are going to expose the wrongdoing. That’s how you hold them accountable. You have to be brave and just run into that controversy. It’s crazy, but that was a good piece of advice. 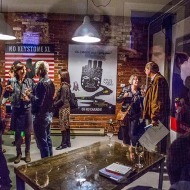 See more photos from the opening. “The content of Franke’s work asks important questions about our relationship to the environment, and our relationships to each other. 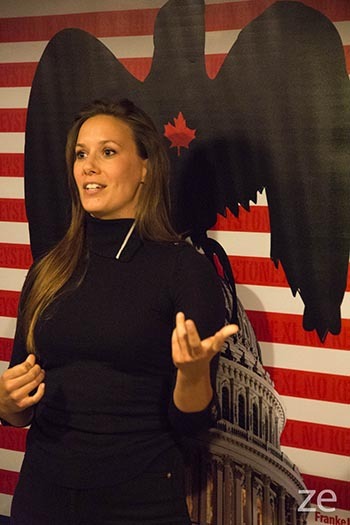 It asks Canadians to wake up and take part in vital policy conversations. 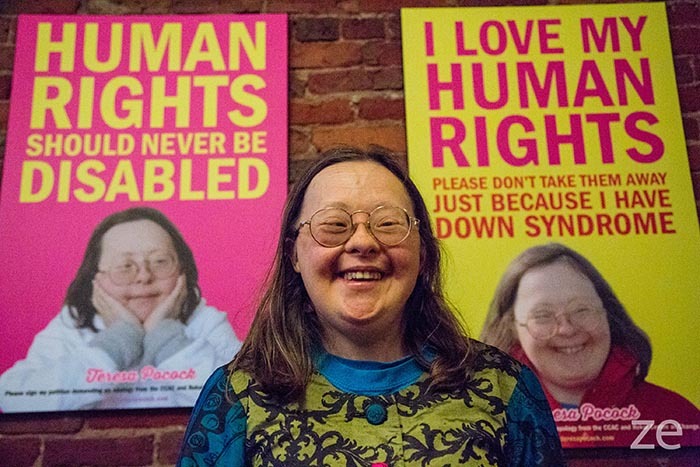 But, for the BC Civil Liberties Association, it’s not the content of speech and expression that we usually worry about; it’s the fundamental rights to engage in these expressive activities at all. 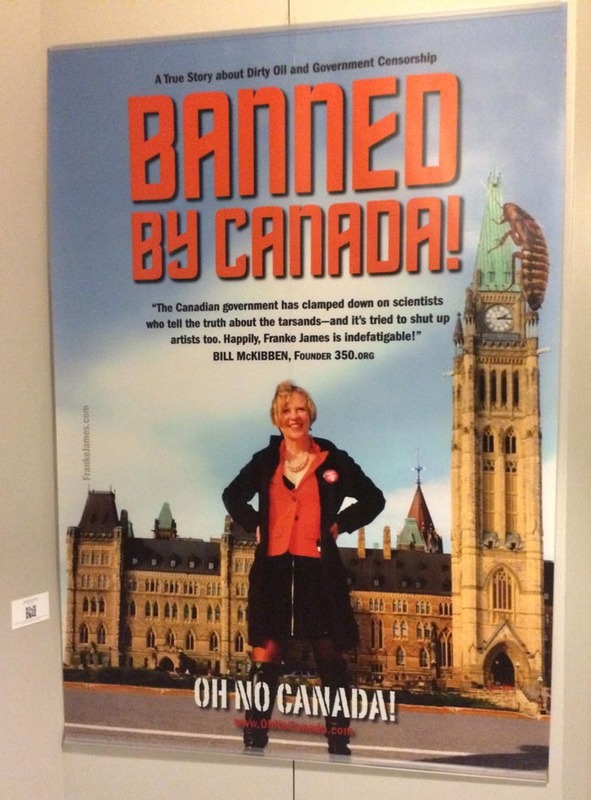 Franke’s experience of having her work censored is a real wake up call to all Canadians that we cannot take our rights for granted. 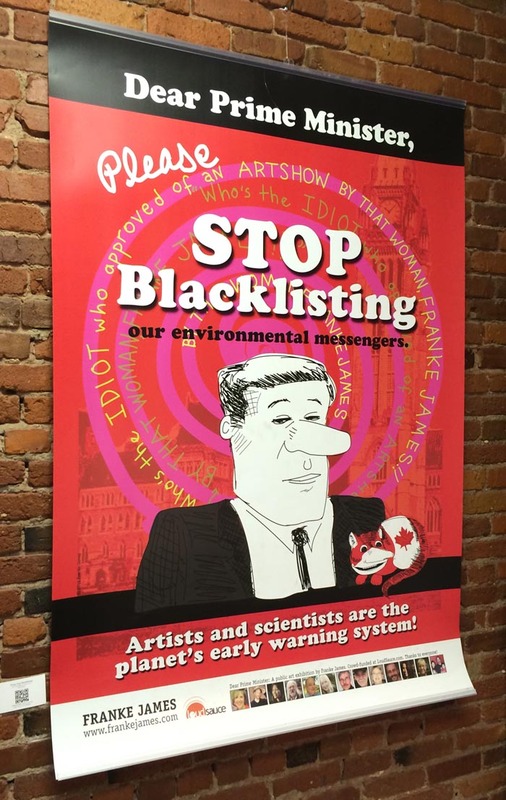 “Across the country we have seen artists censored, activists spied on, and meetings infiltrated, all in the name of silencing Canadians who do not agree with our current resource extraction practices. 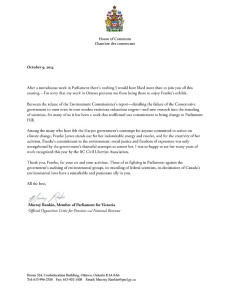 Taking a peaceful stand for the environment should not make you the target of government scrutiny or repression. These kinds of government activities can chill free speech, they can prevent people from taking part in important public debates, and they can hold us back from making good choices as a nation. 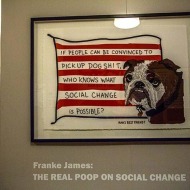 “If the title The Real Poop on Social Change doesn’t get your attention, who knows what will. 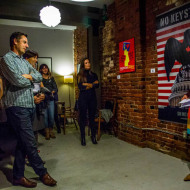 Not to worry, this was the name of a successful art show held on October ninth at The Dock in Chinatown, a new collaborative work centre for social change where Concrete Garden has a desk. 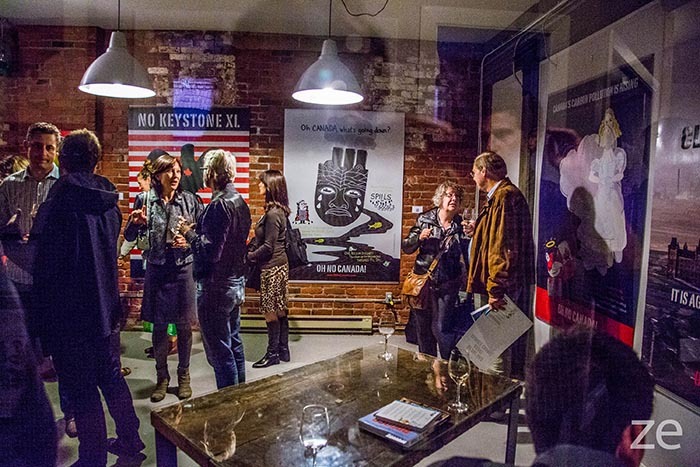 It was also perfect space for hosting artist, author, and activist Franke James. 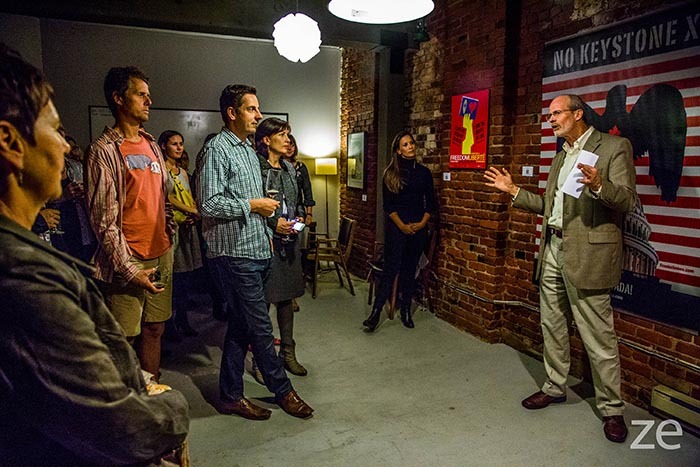 A place where social entrepreneurs and community advocates can share ideas, collaborate, and create a more caring, sustainable future. 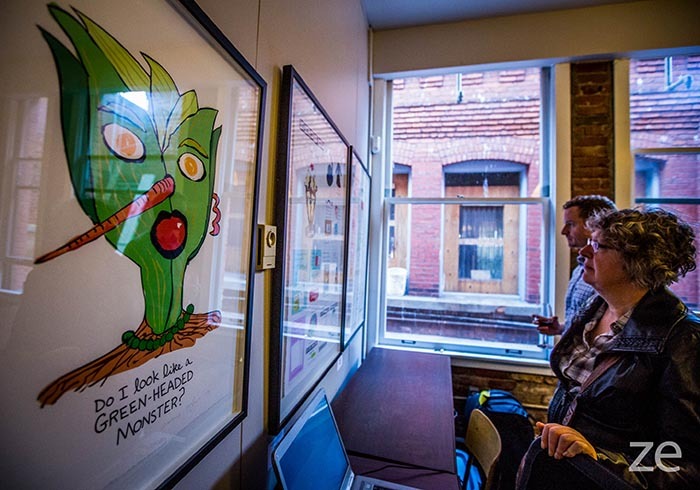 The Dock is a home for Victoria’s free-thinkers, social entrepreneurs, creatives and engaged people. The only thing missing from this brilliantly-put-together link which I got on Facebook is where I can send a cheque to get a book “Banned on the Hill” which would make a great Christmas gift for my grands. outstanding post, Franke! sharing it far and wide! Carry On !! Thanks so much for asking Carolyn! You can buy the book on Amazon.com. 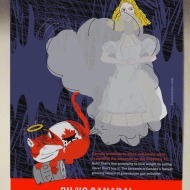 The book is printed on demand in the USA — the $52 list price would be triple if it was printed in Canada — over $150. Or you can buy a signed copy from my e-store. Scroll to the bottom of the page to see the Buy Now button. And limited-edition fine art prints. Thanks for your support and for asking! Let me know if you have any other questions.